The here well known Steven M. Martin movie An Electronic Odyssey 1991 is a very exciting film with and about Lev Termen, Clara Rockmore and Robert Moog themselves. Clara Rockmore is shown in a scene using her own RCA Theremin before a concert. While testing it she plays a certain note over three octaves. So I have used this record to separating the notes and prepairing them in the manner described above for clarinet and duck sound. Here are the results. What you can see is the harmonics remain their amplitude ratios over the first 9 harmonics, the patterns of higher octaves only are influenced by the low pass filtering. And the time signal shapes differ strong due to phase shifts of harmonics. As we have already explained. 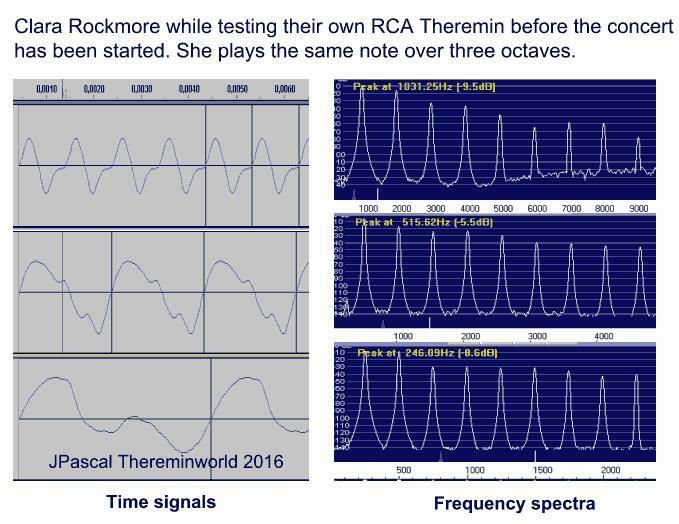 The Rockmore theremin has not the behavior of an classical instrument because of absence of fix resonances and formants e.g. due to a hollow body. Because Clara Rockmore was a brilliant viola artist she makes - with vibrato and laudness effects - that it sounds like a wunderful cello or violin. Assumed, I will be able to reconstruct the RCA sound with the proper harmonic ratios, without Claras experience it would be sound only like a - ...No, that will be a furthermore basic experiment. Interesting. What have you learned about the harmonic amplitude ratios? I'm just one data point, and I'm certainly not trying to discourage you, but I'm really not a fan of the buzzy Claramin sound. IMO it's much too harsh sounding. She does minor miracles with it, but I suppose it's all she had. Just a semantics note here, but the instrument Clara is playing in the documentary is a custom-built theremin by Lev. It's not her RCA Theremin, which incidentally has also been altered by Lev himself for expanded range, tone, and linearity. If the subject for discussion is sound and no one demonstrates any are they to be less respected than a noisy gong or a clanging cymbal? This past thread of mine demonstrates "with sound" my interpretation of the ideal theremin wave shape. IIRC, Clara's Theremin was brought back to life by Bob Moog. Thank you for responses. Its not so easy for me as an english limited non nativ actually to understand alle the content and purpose. So I try some remarks. What I have learned about the amplitude ratios, dewster? The first two harmonics are in about equal hight, followed by the next four in equal hight? 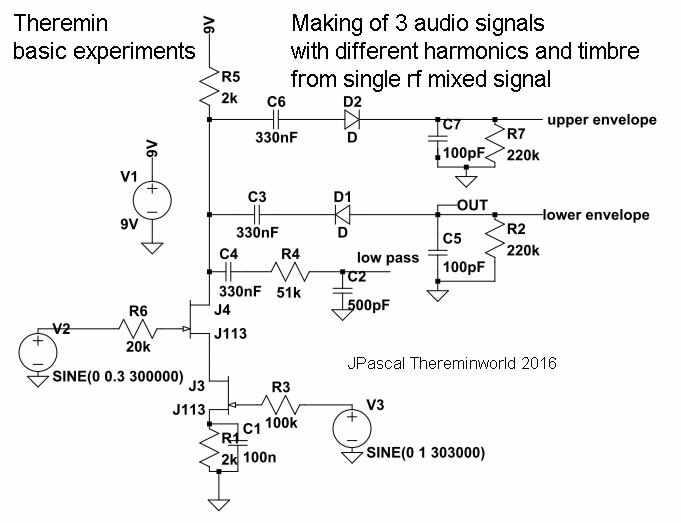 I dont know if that is a typical mixture of harmonics for the old RCA Theremin. But Clara in the HD film played it. Mike, there are several scenes in the film with playing Clara. I will look which I have used: at 2:20 minute in a concert hall. I thought that is her own instrument and a RCA. In another scene Robert Moog demonstrates an old Theremin, I think also RCA. Some time signals are seen very well. I call it for me the elefant shapes. What ist the difference of a note, a tone, a sound, a timbre ore a noise? Cymbals, gongs, drums do not involve mixtures of harmonics, the make noises rather than notes. Examples of sounds here? Pure RCA sound without artists perfomance is rare. I found some examples in YT videos. Its not such good sound as in your mp3 samples, old tecemula. In a few weeks I hope to be not to fare away in line shape and sound with my jFETs. Non perfect example of my circuit I gave in the initial posting of this thread. If someone will hear how sounds it trying piano accompaniment with left hand and simultaneously playing this theremin with right hand, here is the video of mine. God save Clara in the grave that she doesnt hear that. Having the piano mix hampers my analysis of your sound byte, but it seemed very clean and a nice sweet sine wave with minimal harmonics. The ideal harmonic mix develops from the mixer diode biasing and finding the sweet spot in the blending level of the two RF signals. It took me many years to recognize this. You may have looked at it before but "for you" I repost my webpage that has the secret to the sound of Clara Rockmore's theremin design by Lev Sergeyevich Termen. Do not take the information lightly as it took me 15 years to Clarify it. I think the classic theremin will pass with our generation, you may be the last designer who cared. Thank you for the very interesting website, Chistopher. 15 years is a very long time, respect for your power. If the principle is clear and it sounds like the old Clara Theremin, then I am really happy. The volume part is the next thing for me. 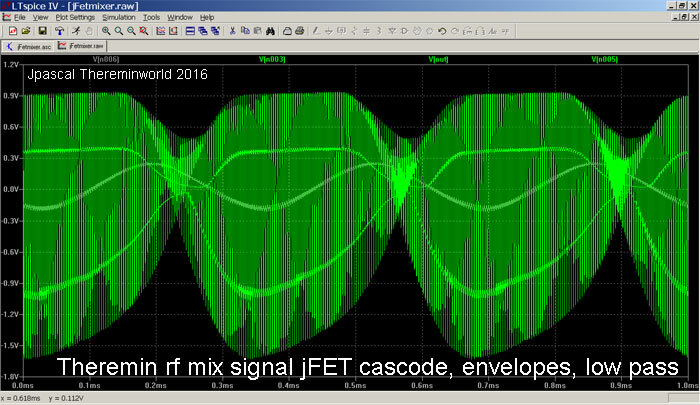 The usual role of diodes in ideal symmetric amplitude modulated signals is to rectify the rf mix signal. 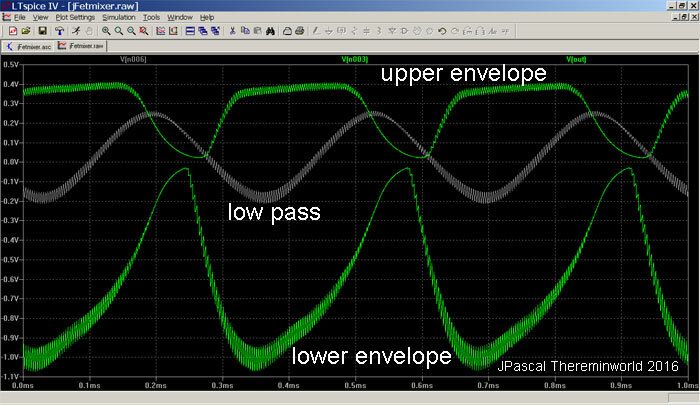 Without diode no audio signal is obtained after the low pass filter. In case of Theremin this mix signal is already disturbed. Thus an audiosignal remains after low pass filtering. Diodes can be used to get the upper ore the lower envelope of the rf mix signal. And so you can choose various of timbres you want. The example here is simulated, but exact so I have measured it with an oscilloscop. If you watch the upper envelope You can see, that it is similar to the signal of Rockmore Theremin. I is easy to show, that by using much higher rf signals the low pass filter allone makes such a signal. So you are in Germany? We are distant cousins. D1 & D2 have no forward bias so no audio will develop. In my experience flipping the direction of the mixer diode inverts the audio wave shape but it is still the same sound. No sound bytes to demonstrate your results concerns me. Has your Modeling come up short? D2 does have forward bias. But you're right, D1 doesn't. JPascal, you might want to add a second RC to kill the remaining RF "fuzz". It's bad when that stuff gets into digital equipment downstream (aliasing).